I seem to be in the habit of choosing an under-rated driver and then supporting him regardless of how others damn him through faint praise. This happened to me a couple of years ago with Scott Speed and I will still defend him against any unfair criticism of his record in F1, even though he has long departed to the world of NASCAR. With the advent of USGPE next year and Scott looking possible as a driver for the American team, it might even be that I have a chance to renew my battle on his behalf. In the meantime, however, my favored underdog has been Kazuki Nakajima, the closest F1 has to a pay driver at the moment. It is no secret that he has his seat because Williams has to keep its engine supplier, Toyota, happy. It is unlikely that Kazuki would be in the sport were it not for his relationship with the Japanese car company and this fact is used to dismiss him whenever drivers are being discussed by the fans. I think this is unfair. Whilst it is true that there have been many drivers who have bought their way into the sport and proved uncompetitive, that is not always true. For instance, a young Spaniard named Fernando Alonso began his F1 career as a pay driver for Minardi. All those who ignored him for that reason at the time are looking pretty silly now. Kazuki first came to my notice when I caught a couple of GP2 races in the tail end of its 2007 season. He had already gained a reputation in the series as a regular podium finisher, although he did not actually win a race, and there was something about his driving that made him stand out. He had that typical Japanese flair and enthusiasm but combined these traits with a caution that kept him out of trouble. Hence the podium finishes in a series famous for the sometimes wild behavior of its drivers. When Kazuki was promoted to F1 as a sort of addendum to Toyota's supply of engines to the Williams team, I agreed with everyone that it was probably a year too early for his promotion. But, having seen his talent in GP2, I was prepared to wait and see whether he could swim in the awfully deep pool he had been dumped into. I tipped him as a man to watch for the future. Quite frankly, Kazuki has done rather well in his first year in the game, considering the premature nature of his arrival. An important clue to his potential was his lap time in his only GP of the 2007 calendar, Brazil. While we all saw his terrible pit stop gaffe, few noticed that his best race lap was quicker than Rosberg's. In testing before the 2008 season he threw in the occasional quick lap to hint at an unexpected talent and has repeated this in 2009 with the fastest time in the final day of the test in Jerez. Then came the races of last year and Kazuki put in a performance that most consider disappointing. Yet the statistics tell a different story - for a man who was supposed to be out of his depth, Kazuki did pretty well when compared with his highly-rated team mate, Nico Rosberg. Kazuki was the quicker in only four qualifying sessions but he finished higher in seven races. That is already a better record than we should have expected from a mere pay driver promoted before he was ready; the boy learns quickly, it would seem. It also tells us that Kazuki races better than he qualifies - a surprise to many who thought he was quick enough in testing but not really up to racing. And there is evidence of a consistency rare in young Japanese drivers: Kazuki retired in only two races, the same number as Rosberg. There is one more factor involved in assessing Kazuki's first year in F1 and that is the matter of confidence; read any of Patrick Head's thoughts on his second driver and you will see mention that Kazuki would improve as he gained confidence. Make no mistake, Kazuki knew that he was getting a break into F1 very early and he had the humility to admit that he would have to learn quickly if he was to survive. He has been a loyal team mate to Rosberg, keeping his head down and never laying claim to undeserved treatment. From his enormous grin, it is quite evident that he feels honored just to be in F1 and that is a refreshing attitude at this level. This time around, Kazuki will be a different driver from the one we have become used to. He will continue to learn but is starting from a much higher base this time. The deference to his team mate will remain (Kazuki is Japanese after all) but I suspect that we will see him on Rosberg's pace or better in far more races in 2009. In Scott Speed's second year in F1, he had done the learning and his improvement had already taken him beyond his team mate in both speed and consistency when Mr Tost finally found a way to get rid of him. Kazuki has a steeper mountain to climb to repeat that feat (Rosberg has a much better reputation than did Liuzzi) but it is not beyond possibility. 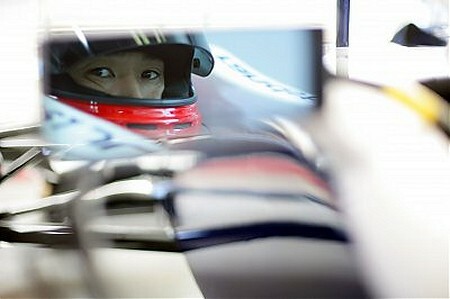 At the very least, I expect that Kazuki will progress from being a worthy second driver to parity with his team mate. If that happens, a lot of commentators are going to forget that they ever under-rated the Nakajima lad. But, thank goodness, I will be here to remind them! He was dependable last year but really not very fast. I think his biggest worry must be Kamui Kobayashi, who's also Toyota-backed and looking quite promising. Kobayashi's had a decent amount of testing mileage from Toyota as well. I'll say this though - I love his crash helmet design which screams NAKAJIMA across the back. Charmingly unsubtle! Okay, let's have a look at that "not very fast" assessment, Keith. Kazuki was quicker than Rosberg in three races last year, so he seems to be capable of putting in quick times on occasion. If we look at race strategies, I think we'll find the reason for his apparently slow times in other races; Kazuki was almost always put on heavier fuel loads than Nico for the start of the race. In fact, if the team were going to try a one-stop strategy, it was always Kazuki who was used for the gamble. We look at his times as slow as a result but the team knows that he was usually at a weight disadvantage compered to Rosberg and that is why Head had faith in him throughout the year. I would agree that he has to make his mark this year or he's out, however. As you say, the grass is always greener on the other side of the fence and Kobayashi looks to be pretty good. I remember Mercedes who were not in F1 at the time paying for a driver who no-one in F1 was interested in to get one race because the normal driver was indisposed. The driver concerned was called Michael Schumacher. He did OK for a pay driver. Either Frank Williams or Patrick Head in an interview last year said that there deal with Toyota requires them to run on driver from the Toyota young driver program and that Williams have a free choice of driver. So if they wanted to put Kobayashi in the car in place of Nakajima they could. So far, so good for Nakajima then, Steven. It must say something for the team's opinion of him that they stuck with him for this season. No doubt Kobayashi will get his chance but I think Kazuki will have this year to prove himself worthy of a seat in the Toyota. I think Kazuki is safer than Keith thinks. He certainly has to show more than he did last year, but I believe there's much more pressure over Bourdais or Sutil than him. The two main problems for him are not under his control: Toyota's F1 future and Kobayashi. And if it's true that Kobayashi looks good and I'd also argue that his 1st GP2 season wasn't as good as Nakajima's and he is still unikely to end the season at 5th place at the standings that Kazuki got in 2007. Clive, Nakajima had heavier fuel loads than Rosberg last season because his qualifying performances were (mostly) quite poor. Having said that, I believe still that if he can get to grips with qualifying this year, then he will deserve to keep his seat as much as any other driver. Just do well in quali, Kaz. I'll love ya forever if you do!!! First thing Nakajima need to do is stop crashing. Fast laps in tests or qualifying wont save him if he ll keep crashing into Alonsos or Kubicas back. Crashtheory: So Nakajima had two minor collisions during the 2008 season; the same or worse could be said of the current world champion and Massa, Coulthard, probably most of the drivers, all of them much more experienced than Kazuki. What I get from that is that he is different from the usual run of Japanese drivers and rookies: he has an unusually low collision rate. That might indicate an over-caution that will handicap him in the fierce competition of F1, but it certainly does not show the foolhardiness that you seem to be accusing him of. See why I get tired of the ill-informed slurs on certain drivers? Hopefully Williams are able to compete in the top 10 this year so we get to see more of Nakajima. Agreed, Toyotafan. And I'm not even a Toyota or a Williams fan - I like BMW! I like Reno and Toyota a little more than the others. I like Ross Brawn, however Im not a fan of his drivers, however it would be good to have his team winning, after all they have been through. I have a soft spot in my heart for williams, as they have been struggling for years to stay afloat, yet they are still here, racing like champs and keeping their noses in the air. Pure sportsmanship! Their pace looks good this year, which is awesome for them. Hopefully their form is strong throughout the year so that they are able to secure a solid sponsor which can help guarantee their future.